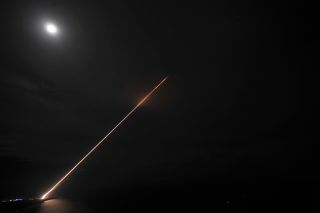 A Terminal High Altitude Area Defense (THAAD) interceptor is launched during the system's first operational test at 1:56 a.m. EDT Oct. 5, 2011, at the Pacific Missile Range Facility, Kauai, Hawaii. The test was conducted by the Ballistic Missile Defense System Operational Test Agency with the support of the U.S. Missile Defense Agency. During the test the THAAD system engaged and simultaneously intercepted two ballistic missile targets. It may be the purest distillation of the swords-to-plowshares idea yet imagined. The best way to send much-needed supplies to isolated communities in the wake of an asteroid impact, tsunami or other natural disaster may be to launch them atop converted intercontinental ballistic missiles (ICBMs), one researcher says. One such missile — outfitted to land its payload softly, of course — could get thousands of pounds of food and water, or power-providing generators, to a devastated area within an hour or so, potentially saving many lives, said Huai-Chien Chang, a doctoral student in space architecture at the University of Tokyo. Chang isn't sure how much such a suborbital relief mission would cost, but he thinks the availability of mothballed American and Russian ICBMs would take a big bite out of the price tag. "These rocket engines are still functioning. If we could use these engines, the cost would be very much reduced," Chang told SPACE.com last month at the American Institute of Aeronautics and Astronautics' Space 2013 conference in San Diego, where he presented his idea during a poster session. Repurposing ICBMs for peaceful use is far from unprecedented. For example, the first three stages of the new five-stage Minotaur V rocket, built by Virginia-based aerospace firm Orbital Sciences, are solid-fueled motors recycled from decommissioned American Peacekeeper missiles. Chang acknowledges that relief missiles would fill a decidedly niche need, servicing only hard-hit communities that are too difficult to reach quickly by truck, boat or aircraft. "The situations would be very rare, except for islands in the Pacific [Ocean], parts of mainland China and Antarctica," he said. But meeting the basic survival needs of potentially vulnerable people — even if they number in the thousands or millions rather than the billions — is still a worthy humanitarian goal, he added. "I'd like to see something like this happen before the next big disaster hits," Chang said.